Okay, this guy can be pretty scary. Since as Ratatoskr, you'll want to get up close to your targets, Agni makes sure that fighting against you is literally a living hell with his stunning abilities and up-close fire tricks. Only attack if his cool-downs are on, he has low mana or is a bad Agni in general. Not too bad, but I recommend fighting her with your team. Whilst alone, she can quickly turn you into a Squirrel Stew, and no one wants that... Dart away from her during 1v1 situations. Being a Fenrir fan-boy and all, Ratatoskr hates starting fights with Fenrir as they are simply best friends. But in all seriousness, be very careful of Fenrir, if he jumps on you, Acorn Blast and Dart away as his damage output is just too difficult to combat. Getting close to Scylla can really be your downfall and unfortunately, getting close to enemy gods is the only way to kill them, she'll shut you down with her scary combo, wait until her abilities are down to attack, but even then it is risky. Hey everyone! I'm Max, I enjoy playing conquest, clash and arena especially while using Ratatoskr who has been my main since pretty much Day 1. After playing so much time of him, I think it's finally time to reveal how I use him so that new or returning Ratatoskr players can quickly learn how to master him or just simply use him a bit better. This is a guide for Ratatoskr in general (arena, clash, joust) and also Conquest in the Jungle. Note: I am still updating this guide, I appreciate and look at any feedback via comments on this guide! Ratatoskr comes with a rather fun set of abilities that work well together, he is a sneaky assassin who jumps onto a target, shreds them, then jumps to the next target and so on, until he needs to dash back to safety. Acorn of Yggdrasil Is a unique passive in which Ratatoskr begins the game with a powerful acorn that can be upgraded from anywhere on the map. It replaces Boots and includes more power and movement speed than Warrior Tabi when fully upgraded. 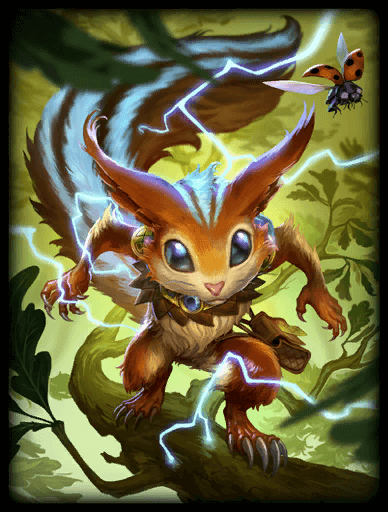 Not only this but it also heals Ratatoskr for damage done with abilities which helps his sustainability in the jungle and in general. Dart When activated, Ratatoskr dashes forward in a straight line. Dart is the core part of Ratatoskr's kit, it is his main movement ability and can be used to initiate or escape. The ability goes through minions but stops when coming into contact with an enemy god and slows anyone that it hits which is extremely useful in helping Ratatoskr get his basic attacks and abilities off on the target. This ability's cooldown can be reduced by 1s for every god hit with Ratatoskr's other two abilities: Flurry and Acorn Blast which encourages Ratatoskr to get into team fights to escape or use abilities on nearby foes when running away. Flurry When activated, Ratatoskr bursts into a flurry of attacks in a circular, whirlwind motion. Flurry is extremely useful when tearing down squishy enemy gods that have a few protections on hand like the enemy jungler as it reduces their protections more and more with each hit of the ability, allowing Ratatoskr to gain the upper hand. Acorn Blast When activated, Ratatoskr throws out three acorns from his position in a cone. This serves as Ratatoskr's surprise ability and will stun any opponents that are hit by all three acorns, which is its primary function. Through the Cosmos When activated, Ratatoskr jumps into the sky and lands on a branch above his head after a short charge-up time. Once on this branch, Ratatoskr may jump to two more branches before being forced to land at a target location, knocking any opponents up that are caught within the radius. This ability can be cancelled at any time while in the tree, causing Ratatoskr to land where the targeter is but with a slightly smaller radius than if he were to jump to all three branches. With this ability, Ratatoskr can gain a great view of the map and travel to distant places to get into the fight when needed, it also creates a very big element of surprise when done from behind the enemy, they can hear you jumping around in the trees if they are too close, however. Use this to sneak up and initiate a fight with the knock-up. In order to deal lots of damage using Ratatoskr's kit you'll want to use this combo: ( Dart -> Acorn Blast -> Flurry). The dash will first slow the enemy, giving you a clear shot at hitting all three acorns if you get as close as possible, finally, the Flurry will tear away protections and allow you to then finish them off with basic attacks. One I find myself using more often is ( Acorn Blast -> Flurry -> Dart) as Ratatoskr without a dash is often roadkill, I'd use it to escape and use basics along with the combo above and use Hydra's Lament in your favour. Another good combo utilizing his ultimate is ( Through the Cosmos -> Acorn Blast -> Dart) to secure kills and then find a way out quickly with his dart, it is key that you save Dart for quick kills or getting away. I often do NOT push without either having Dart or Through the Cosmos to get out of a sticky situation or possibly rain hell back down again. Acorn of Yggdrasil - This item is always on Ratatoskr in his first item slot no matter the game mode. It substitutes for boots, having higher movement speed than Warrior Tabi and higher damage. It also gives Ratatoskr a huge advantage in the Early Game as he does not have to pay for Tier 1 of the item. However, the acorn does cost more than the average boots. Hydra's Lament - I always purchase this as Ratatoskr's second item as it provides a great boost to his kit in general. Since this God is torn between basic attacks and abilities, this item helps him use his kit more wisely. When Ratatoskr uses an ability such as Dart, his next basic attack will deal significantly more damage which really helps with his whole combo in general. This also contributes to his cooldown reductions which are very important. Another advantage of this item is the MP5 it gives for missing mana which yet again helps his sustainability, definitely a must-pick for me. Breastplate of Valor - This is a very important defensive item for Ratatoskr, especially in Conquest. If you're gonna do damage, you need to be able to take it, too and this item provides Ratatoskr with the protection he needs against the enemy jungler, especially if the majority of the enemy team is physical damage in any game modes. Spirit Robe - Recently, I have started to use this way more often than Breastplate of Valor due to it resulting in a build that goes over the cooldown cap, it provides both physical and magical protection and therefore helps Ratatoskr balance out his protection against both damage types from opponents. Bulkwark of Hope - If the enemy jungler is a magical type, get this instead of Breastplate of Valor as it provides the magical protections that you need to survive attacks from the enemy jungler or if the majority of the enemy are magical, this is a good buy. The Crusher - The Crusher is a great item for Ratatoskr as a replacement for Jotunn's Wrath and generally fits his playstyle well, if you get an enemy low enough and wish to Dart away as using it on the enemy may leave you without an escape, The Crusher will take out the enemy with its bleeding passive. Mantle of Discord - An item that not only provides amazing protection and the right amount of cooldown reduction to trade out with Spirit Robe, but it also has the power to give you that extra time to get away from enemies or take out that pesky low-health one and give you your Bloodforge shield to allow you to continue in the fight with its stunning passive. Ancile - This item is great against Magical Gods and allows you to have the upper-paw on enemies with its stunning passive, it's great for annoying the enemy jungler if they're magical! Jotunn's Wrath - A very basic item that is picked up to amplify your stats in general, primarily giving you higher damage output and lowering your cooldowns. It comes with many bonus effects and is definitely a core item to buy. Masamune - A great item to use on Ratatoskr as team fights will certainly happen often, and you may even be near enough to enemies for the passive to help you when stalking above your prey whilst sitting in your little cosmic tree of death. Bloodforge - I always purchase this on Ratatoskr as it really helps him survive the huge team fights that happen near the end of games, especially conquest. This allows Ratatoskr to gain a temporary shield upon killing an opponent which comes in all sorts of useful situations. Such as when you wish to dash from target to target and still be able to fight the next one, or if you are escaping and your shield manages to just keep you alive while you escape to the safety of Yggdrasil in Through the Cosmos. Bloodforge is definitely a must buy for me. Heartseeker - I recently added this item to my general build as it really helps with the whole kit. You build up your next ability's damage with basic attacks and then unleash havoc. It's an easily understood item and works very well with kits such as Ratatoskr's who is split between basic attacks and abilities. Deathbringer - This is a great item if you wish to lean towards the basic attack side of things, getting those huge critical attacks off will really shred the enemy. I have recently cut this out of my main build due to Heartseeker but I still use it from time to time. First of all, you'll want to head straight over to the yellow/gold buff where you will hopefully have some help from the mid-laner to clear it and grab the buff for yourself. After this, journey over to the nearby XP camp and clear it on your own. Once this has been completed, head over to the blue buff and inform your solo-laner that you are dropping their buff for them. After this, you have already started your journey in jungling, it is now time to do what you wish to do. I recommend ganking either the mid-lane or solo-lane enemy and applying pressure while gaining some XP from the minions. Don't be aggressive until your Acorn of Yggdrasil is fully purchased. You don't want to return to base early on as this gives the enemy jungler an advantage, try and gain enough money to upgrade your Acorn of Yggdrasil while in the jungle and not at the base. From here on, move around and help your teammates out with XP camps and buffs, don't forget to keep going back to your main rotation (Speed Buff -> XP Camp -> Blue Buff) as your solo-laner will count on you to help them out with it early game. Try not to be too aggressive, this can result in you returning to base or flat-out getting killed. Here we are! The mid-game! By now you should have Acorn of Yggdrasil to its Tier 3 and one of your chosen damage items to Tier 3 and possibly even Tier 1 of a protection item! In this phase, you should be attempting ganks on unsuspecting targets and hopefully even challenging the enemy jungler to duels (and winning them!) if you're brave enough. If you have knowledge of warding, then definitely get placing wards to catch your enemy jungler off-guard or even be overly aggressive and steal the enemy buffs. Don't go over-the-top with this, and only do it if you know that the enemy jungler is dead or on the other side of the map and in a fight, it will give you an advantage but it's high-risk, high-reward. You should also be pushing with your team to grab objectives such as towers and the bigger buff camps, mainly the Gold Fury and the Oracles as these are rather easy to kill mid-game with your whole team fighting them. Now your build should be full and you should be very cautious. Your damage and overall effectiveness are not as good as it was during Early and Mid-Game but you can still initiate fights with Through the Cosmos and shred unsuspecting squishy targets as well as help, take down the enemy tanks. Your primary role is to take out the squishies in the back-line to create openings for your team to go in and take out the entire enemy team. Ok, now looks better without that horrible Deathbringer (I'll call it DB), however, you listed Hastened Katana (HK) as an option (and DB stills there). HK were made for basic attacker sticks on their targets since these gods usually lacks some stick capacities. It's not the Rat case. You can use Dart to get closer and slow the enemy, Acorn Blast to stop them and IF they get out alive you use Through the Cosmos to get them. Rat cannot stay for long times stuck on the same target, hitting Basic Attacks, he wasn't made for it, that's why he has a progression on his basics (hitting 1, 0.5, 0.5, 1.5). He was made to be a burst god, who jumps on the enemy take a good part of his health/kill him them retreat. So I strongly recommend you remove completely both HK and DB from your list. Let these items for Basic Attackers assassins as Kali or Bakasura. Make these changes and your guide will be perfect and I will give you the +1 you deserve! 137955 xmysterionz Ok, now looks better without that horrible [[deathbringer]] (I'll call it DB), however, you listed [[hastened katana]] (HK) as an option (and DB stills there). HK were made for basic attacker sticks on their targets since these gods usually lacks some stick capacities. It's not the Rat case. You can use [[dart]] to get closer and slow the enemy, [[acorn blast]] to stop them and IF they get out alive you use [[through the cosmos]] to get them. Rat cannot stay for long times stuck on the same target, hitting Basic Attacks, he wasn't made for it, that's why he has a progression on his basics (hitting 1, 0.5, 0.5, 1.5). He was made to be a burst god, who jumps on the enemy take a good part of his health/kill him them retreat. So I strongly recommend you remove completely both HK and DB from your list. Let these items for Basic Attackers assassins as [[kali]] or [[bakasura]]. Make these changes and your guide will be perfect and I will give you the +1 you deserve! Yeah the items are good and builds too except for one thing: the Deathbringer. Rat has a lot of progressions on basic attacks and also he is not a basic attacker, so build something else. As a summary, this build has some major flaws, though I like the effort put in the writeup for abilities and item choice explanations. I'll give reasons below. In both your general and Conquest builds, your example builds are all overcapping CDR. I'm not sure if you're aware there's a cap or not, or what else might be going on here, but the max cap is 40%. Your core in the general build has Hydra's (10%), Breastplate (20%), and Jotunn's (20%). You should not do this. You need to choose a direction, if you like Hydra's Lament that much. Your direction will be to commit more to offense via Jotunn's Wrath, or be a more common bruiser with Breastplate of Valor. Don't ever build both in the same build...maxing yourself with those two items drastically limits any other build directions you might go. For example, you have Mantle of Discord listed in your Conquest build options, and that ALSO provides 10%. Ratatoskr probably doesn't need Golden Blade. Based on the location of purchase in this build, I don't think you understand its main purpose. It's got a low price (2,200 gold). This allows you to build it early without too much delay. Why would you get it early? For jungle camp clear. This isn't going to do much for you in a teamfight late-game, which is when you're building the item. Either get it early, or don't get it at all. In any case, the reason I said he probably doesn't need it is because his general clear is fairly good. His 4th hit in his basic attack progression provides AOE damage, and combined with one ability use (either Flurry or Acorn Blast), he should be generally fine with clear. This is in opposition to different assassins like Mercury, where GB is hugely functional. Merc doesn't have any AOE basic attack function, but instead, Made You Look triggers item effects, making GB provide basically immediate clear. You say that Flurry allows Rat and his team to rip through tanky opponents. This might be arguing semantics, but as this is flat protection reduction (24 at max rank and max stacks), it's really more effective against squishy enemies, which is also its purpose. This is not a tank-killer ability. As a side note, it works very well with additional protection reduction provided by Void Shield, which is a great item for him if you're facing a fairly squishy enemy comp...but is completely missing from your options. That is a huge oversight in my opinion. In your Acorn Blast writeup, you say the combo you want to use is Dart -> Acorn Blast -> Flurry -> Basics. That's ONE combo...but not the only one, and this combo is very situational. 1: using Dart first is great for getting CDR from other abilities used after, but it also burns your escape. When possible, you actually want to save your dash for future chase, or to escape. Instead, walking up to the enemy and starting with Flurry gives you the best damage potential, due to dropping their protections at the start. But again, that's only one other combo. There are many functional combos for Rat. Not just one. Another popular bruiser item missing in your general build is Ancile. Again, I don't think Golden Blade is a good item choice for Rat, and you even have it listed as an option here for the Arena build. Just completely take it out. It's not good here. Weirdly enough, you have a category for "Basic Attack." Rat shouldn't focus on that. In addition, the only truly basic attack item there is GB. Heartseeker is a burst damage option for abilities, with stacks built by basic attacks. That does NOT make it a basic attacker's item. And Masamune is just a general bruiser item...no direct relationship with basic attackers vs. ability users. Bloodforge as a general item is fine...but not key/core. You're not a huge burst god, and in teamfight situations, it's not guaranteed you're going to get the last hit...so you might not see the passive shield reliably. It IS okay as an item choice...just not what I would personally consider a must-buy. Obviously we have differing opinions here, and that's fine. You list Deathbringer. Please don't do this. If you really want more damage, you've got a variety of other options that you DON'T list. These include things like The Crusher, Brawler's Beat Stick, Shifter's Shield, etc. If you need an explanation of why you don't build DB on Rat (especially as a standalone crit item !#!#@) then let me know and I'll explain. You underestimate the power of the Deathbringer! But, seriously, not all gods can utilize crit properly; and those that do need at least two crit items to make it worthwhile. When you only buy one crit item, you're basically wasting your gold because of how random the crit chance can be. Plus crit needs a lot of power to work properly and that's hard to build when you're also building protections. Leave crit to the hunters and AA assassins. Go with a bruiser build for the rat. 133583 Gulfwulf You underestimate the power of the [[deathbringer]]! But, seriously, not all gods can utilize crit properly; and those that do need at least two crit items to make it worthwhile. When you only buy one crit item, you're basically wasting your gold because of how random the crit chance can be. Plus crit needs a lot of power to work properly and that's hard to build when you're also building protections. Leave crit to the hunters and AA assassins. Go with a bruiser build for the rat. I like your build and your guide at all, but let's talk about some doubt items you listed. First of all, Golden Blade should not be built on rat. He has a big clear and when you finish building it he is clearing the entire camp using only Flurry and 1 or 2 basic attacks. I don't thing it worth. Plus your build is overcapping 10% of cooldown (the first one). Also consider some defensive magical item on him such as Ancile or Bulwark of Hope or even Genji's Guard. Although I strongly recommend you build a bruiser rat. With your build using full power you can really destroy the early and mid game but at late game you will die before anyone, so try to build some protections to him. A good bruiser build could be: Shifter's Shield, Ancile, Void Shield, Hydra's Lament, Jotunn's Wrath and then you sell the shifters if you want and put a Mantle of Discord. And please, no crits on ratatoskr. 133575 xmysterionz Hello Maxatoskr, I like your build and your guide at all, but let's talk about some doubt items you listed. First of all, [[golden blade]] should not be built on rat. He has a big clear and when you finish building it he is clearing the entire camp using only [[flurry]] and 1 or 2 basic attacks. I don't thing it worth. Plus your build is overcapping 10% of cooldown (the first one). Also consider some defensive magical item on him such as [[ancile]] or [[bulwark of hope]] or even [[genji's guard]]. Although I strongly recommend you build a bruiser rat. With your build using full power you can really destroy the early and mid game but at late game you will die before anyone, so try to build some protections to him. A good bruiser build could be: [[shifter's shield]], [[ancile]], [[void shield]], [[hydra's lament]], [[jotunn's wrath]] and then you sell the shifters if you want and put a [[mantle of discord]]. And please, no crits on ratatoskr. Well played, Myst. You beat me to it. 133577 Branmuffin17 Well played, Myst. You beat me to it.